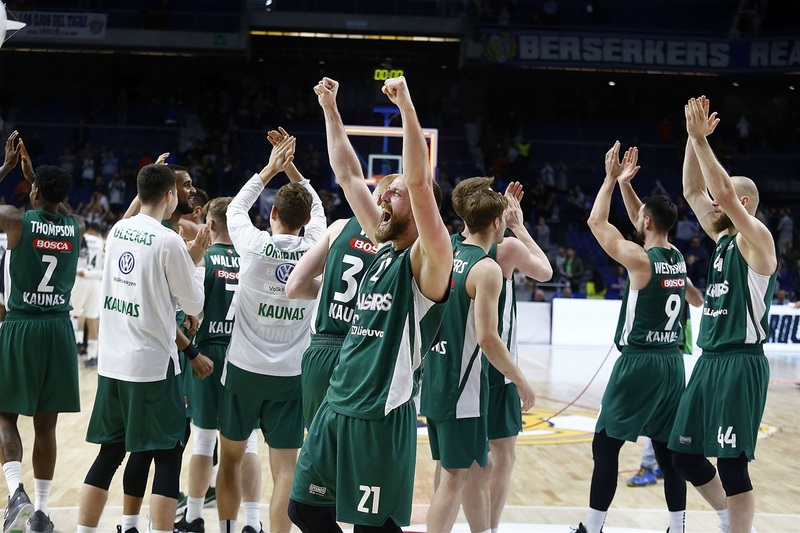 Zalgiris Kaunas wasted a 16-point lead, but finished its magical run to the playoffs with an 86-93 victory at Real Madrid - the Lithuanian club's first win in the Spanish capital since the 1999-2000 season. 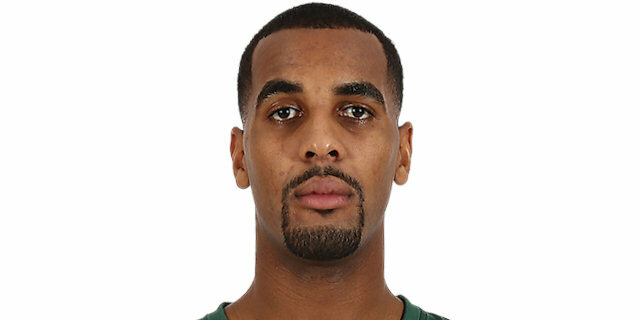 Brandon Davies scored 12 of his 27 points in the final 5 minutes to go with 10 rebounds, 2 assists and 2 steals as Zalgiris won its final six games of the season for a 15-15 record to sneak into eighth place and a date in the postseason against Fenerbahce Beko Istanbul. 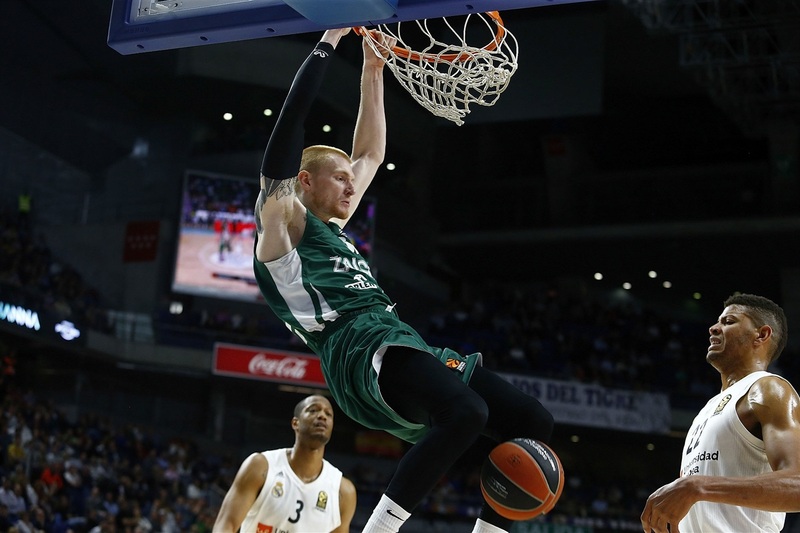 Antanas Kavaliauskas chipped in 10 points for Zalgiris, which snapped an 11-game losing streak to Madrid. 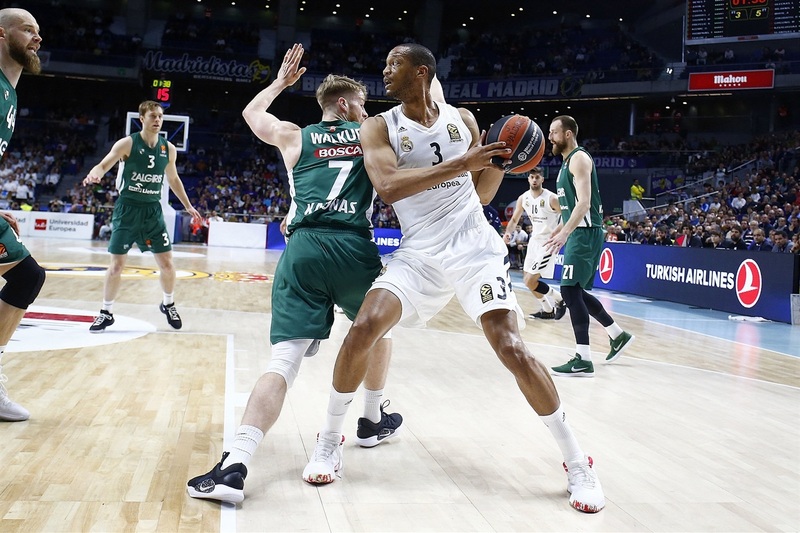 Walter Tavares scored a career-high 22 points in addition to 7 rebounds and 2 blocks for Madrid, which dropped to 22-8 with its second loss in the last three games. The defending champs will take on Panathinaikos OPAP Athens in the playoffs. Anthony Randolph added 17 points and Jaycee Carroll had 11 in the loss. Madrid pounded the ball in the paint early with Taveras scoring twice in the first minute for a 4-0 lead. Leo Westermann nailed 2 three-pointers as Zalgiris went up for the first time 6-8. The inside game continued for the hosts with Gustavo Ayon off the bench for a 16-12 lead. 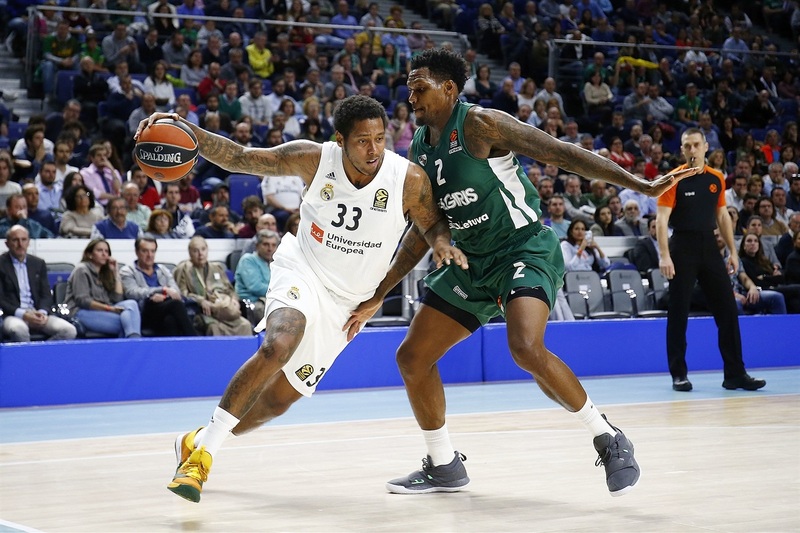 An Edgaras Ulanovas three helped put Zalgiris back ahead 16-17, but Randolph took over the inside scoring for Madrid and another Ayon basket had the hosts up 27-23. It was 27-25 after 10 minutes – with the trio of Taveras, Randolph and Ayon combining for 17 points. 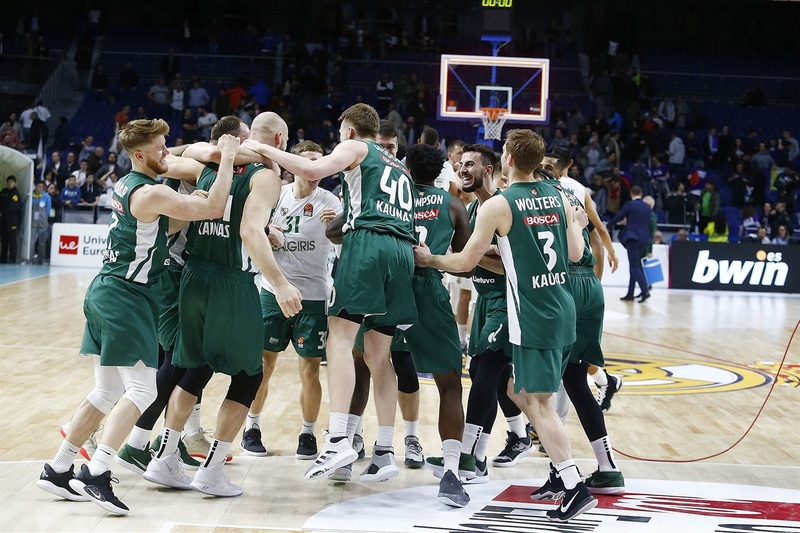 Zalgiris used triples from Nate Wolters and Arturas Milaknis to move ahead 29-33 and a dunk and 2 free throws from Davies made it 33-39. 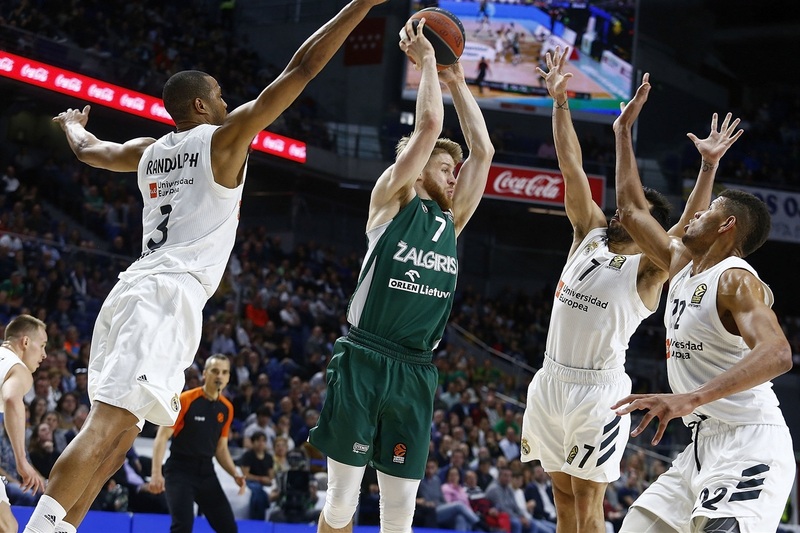 Trey Thompkins responded with Madrid's first triple, but Kavaliauskas knocked down a pair of elbow jumpers as the advantage grew to 37-46, which was the score at the break. Neither team scored in the first three minutes of the second half until Marius Grigonis's three-pointer for a 37-49 lead. 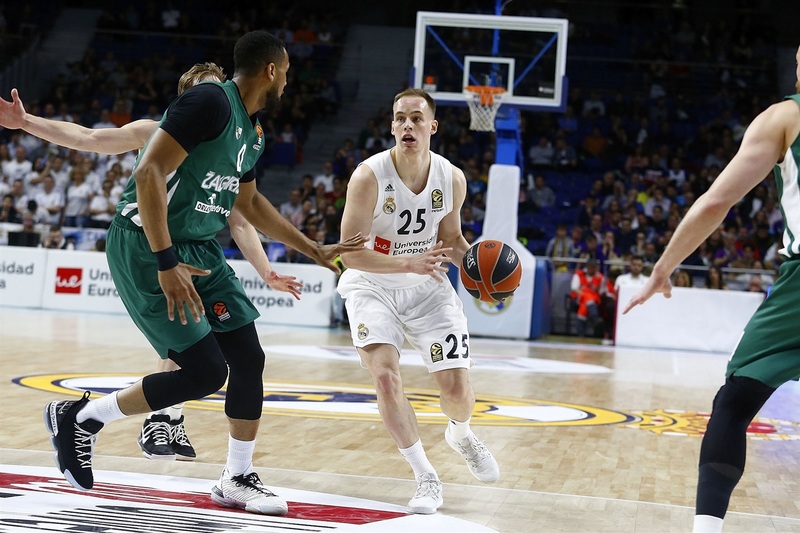 Carroll stopped Madrid's drought 4 minutes into the third quarter, but Wolters and Davies converted three-point plays and the cushion swelled to 43-57. 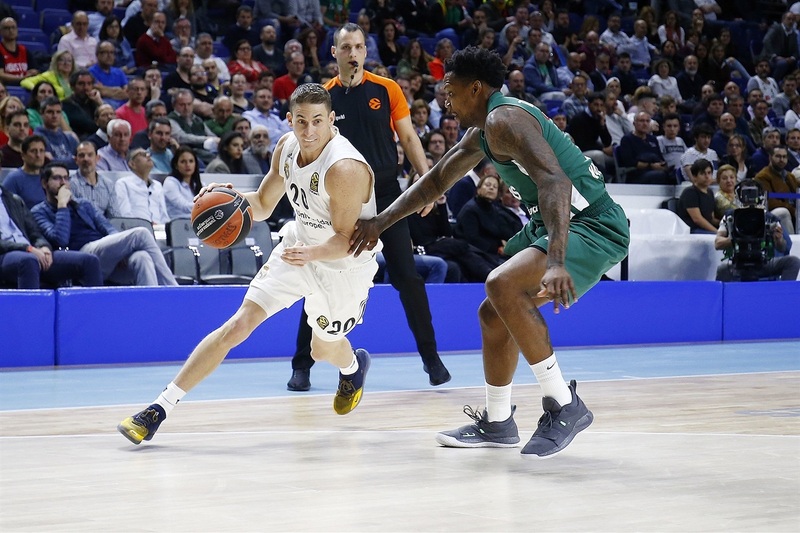 Tavares made it 47-61, but Madrid rebounded his missed bonus free throw and Klemen Prepelic nailed a three-pointer after the hosts had started 1 for 13 from long range. Aaron White responded with a triple of his own only to see Randolph punch back with a three. Carroll made all 3 of his free throws to cut the deficit to 6. The score was 60-66 after 30 minutes. 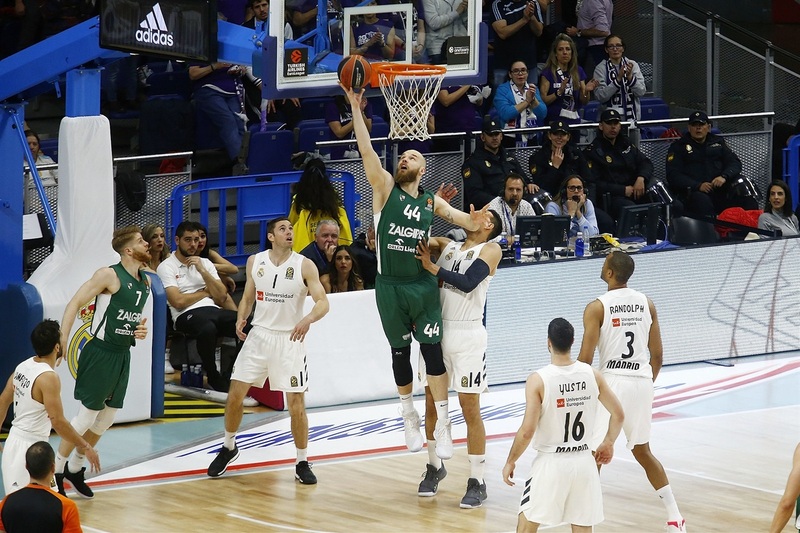 Milaknis's free throws started the final quarter for a 60-68 advantage, but Madrid continued to play off its momentum with Tavares and Prepelic trimming the gap to 68-70. Tavares added two more baskets before Randolph's free throws knotted the game at 74-74 with 5 minutes left. 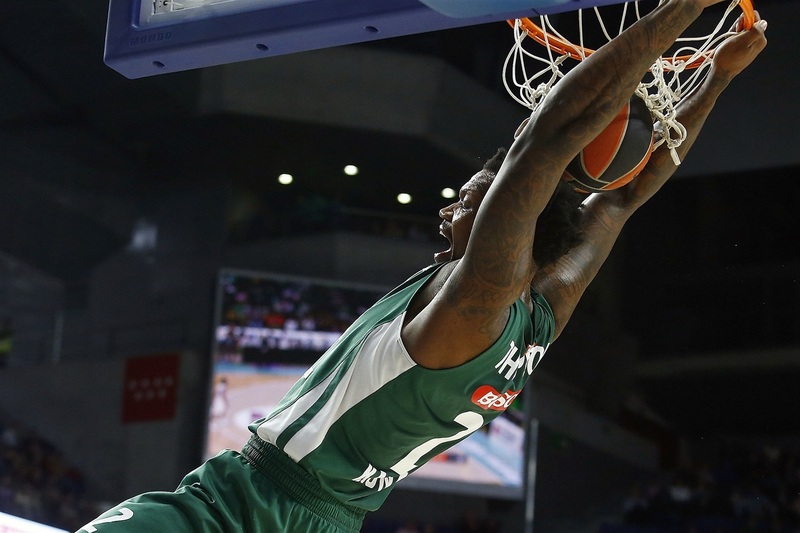 Randolph put the hosts up 77-76 with a three-pointer, but Davies took over the game for Zalgiris with 12 straight points as he countered every punch from Tavares and Randolph. His steal led to Westermann's layup for an 83-88 advantage with 36 seconds left. Zalgiris finished strong with Edgaras Ulanovas making 4 free throws in the final 20 seconds. 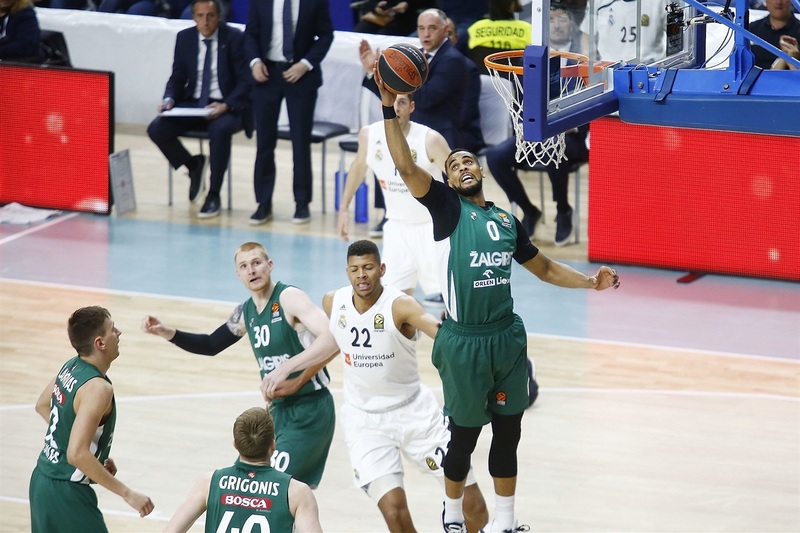 Real Madrid had erased Zalgiris's 16-point lead, but Brandon Davies put his team on his shoulders and scored 12 straight points to guide the Lithuanian champs into the playoffs. Brandon Davies did everything for Zalgiris with 27 points on 10-of-15 shooting and 7-of-7 free throws, 10 rebounds – including 5 off the offensive glass, 2 assists, 2 steals and 5 fouls drawn for performance index rating of 34. Madrid made just 4 of 21 three-pointers (19.1%), while Zalgiris turned the ball over only 9 times and made 22 of 26 free throws (84.6%). Real Madrid was set up in third place and will now take on Panathinaikos OPAP Athens in the playoffs. 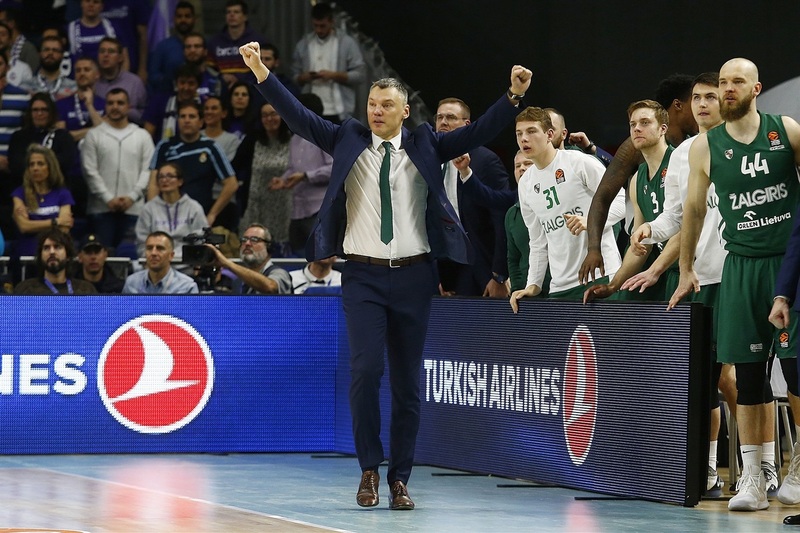 Zalgiris now has a date with Fenerbahce Beko Istanbul in the best-of-five quarterfinals. 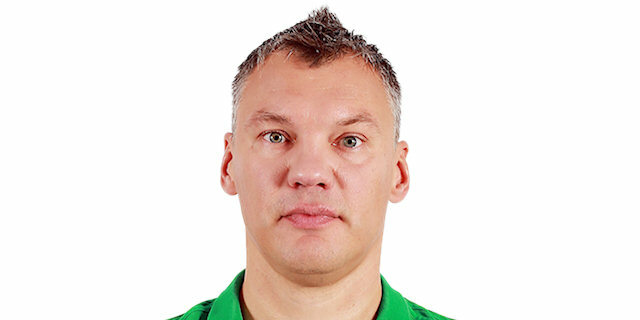 "Congratulations to Zalgiris for the win and classification for the playoffs. They proved that the season is 30 games long. Their final part was very good. They managed to qualify with 15 wins. So I would like to congratulate Zalgiris and the other teams that qualified for the EuroLeague Playoffs. Obviously, I don’t like to lose. But that said, we won 22 of 30 games and that speaks volumes about the team and the work throughout the season. Now we want to forget the regular season as soon as possible in spite of all the good things and be happy about the situation where we are. We are facing Panathinaikos, which is a very complex team. We know that. We know how difficult they are. 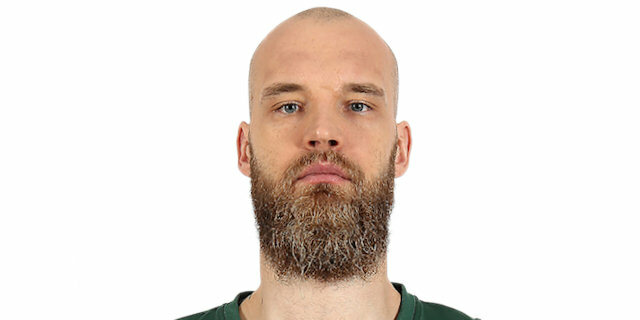 They are very physical and Calathes is very difficult to control. We know about them and we will use the next 10 days to get ready. About today's game, I think we started offensively correctly. We moved the ball well. We had a very bad second quarter and they turned the game around. We worked to come back and the final moments were quite wild and Davies was quite good and we were not able to read the situation - neither on defense nor offense. Obviously, the motivation was better on their side. I would have liked the win, especially after we came back." "Congratulations to my players, to our organization and the city of Kaunas for a big accomplishment for our team. I have to talk about the character of my players who never gave up and believed in what we are trying to do here. And as you can understand, the playoffs for us is a big accomplishment. We will go celebrate tonight, at the same time we have to forget about it as quickly as possible and prepare for the best team in Europe." "It is true that there was nothing at stake for us tonight, but we played to arrive well to the playoffs with confidence. We had some losses in the last weeks and wanted to play a better game, play better basketball and we couldn't. That bothers us. What we have to do in the week and a half we have before the playoffs is to practice hard and try to play good basketball in the upcoming games to reach the confidence we need in the EuroLeague playoffs. We had ups and downs, which has happened a lot in the last few games and it is something we cannot allow. We have to be a much more solid team that always plays at the same level. If we managed to keep a good level during the game, we will able to reach far, but if we don't, we will have a hard time. Playing against Panathinaikos is hard, especially on the road, but the good thing is that we have the home-court advantage. We had to be strong and in order to do that, we have to change a lot of things, play tougher and not allow our opponent to get a lead which can be decisive. In the EuroLeague playoffs, games are tough and physical. We all have to give 100% and play to win from the very beginning." "It is a great feeling, especially the way that we had to get there. A lot of people counted us out, but in our locker room, it is all that matters. We are the ones that believed. We grinded those wins, one by one. I was getting good looks; we have to give our coaches a lot of credit for this kind of report they put in, and we executed. I am excited. 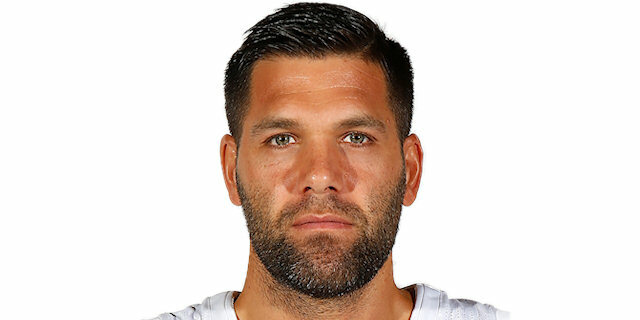 It doesn't matter who we are playing. The fact that we got there and we are there, we can compete with anyone. I believe we will keep this thing going." "It is an amazing feeling, especially after the run we had in the last games to make it here. We are really happy. Last year, we qualified to the playoffs in Madrid and this year, we qualified to the playoffs in Madrid as well. We had nothing else to do; we had to pull out things together, get our basketball right and play the right way. Fortunately, luck was on our side this time. Fenerbahce is a great team. We just have to work and we will see what is going to happen."